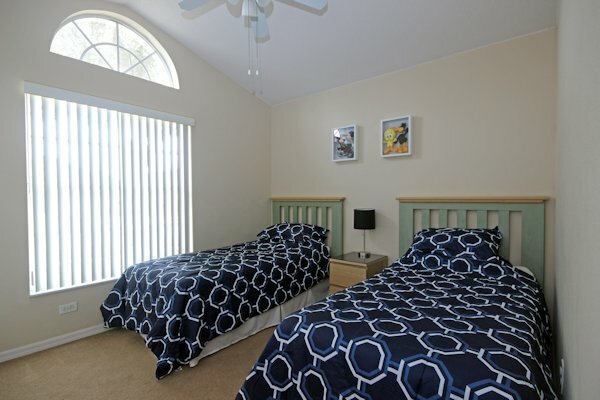 Our beautiful 3 bedroom 2 bathroom luxury villa is only 15 minutes from Disney World and located just 5 minutes from the 192 giving easy access to all other Orlando attractions, supermarkets and dining. Facing west, the spacious pool area is bathed in sunshine throughout the day. 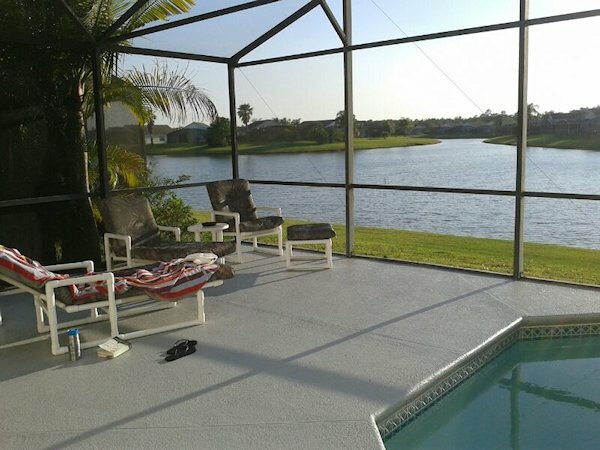 Overlooking a large lake, the patio is the ideal place to relax and perhaps watch the sunset.This is our home in Florida and we spend as much time here as we possibly can and when we can’t be here would welcome the opportunity to share it with you for your vacation. The rates listed below are for renting the ENTIRE VILLA for the stated duration (and not per person). That means you pay the same rate regardless of how many people are staying. 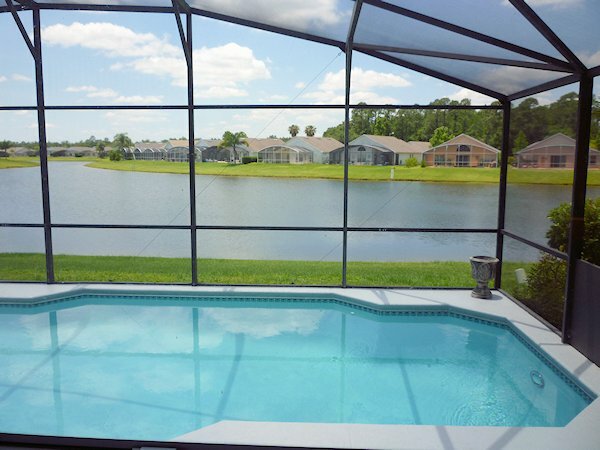 Booking through Disney Villas Florida also gives you the best price with no Service Fee, so you're unlikely to find the same villa cheaper. Where prices 'per week' are quoted, additional nights are normally priced on a pro rata basis. Where rates are shown in different currencies e.g. UK Sterling and US Dollar, this means that the owner accepts payment in either of the currencies. Click on the 'Booking Details' tab for details of any discounts which may apply or optional extras e.g. Pool Heating. Rates for renting this villa and not per person. Where the rate shows '+ tax' alongside, then local taxes at 13.5% must be added to this price. Quoting US Dollar prices net of local taxes, is common place. Where '+ tax' is not shown alongside, then the prices already include local taxes. To estimate the price to rent this villa, enter the number of nights to stay and select the period which corresponds to your arrival date. Where there is a change of rate during your stay, this will not be factored into the price. If the everything looks ideal, don't forget to enquire about this villa. When booking, payment is normally made using a bank transfer, a UK Sterling cheque or a US Dollar check. Where indicated, the owners of this villa are also able to take payment using PayPal or a credit card. A deposit of £100 per week is required, with the balance due 8 weeks prior to the start of your stay. Pool heating which is recommended from the beginning of November until the end of April is available for an additional cost of £85 per week. Please contact the owners for a confirmed price quote for your holiday. 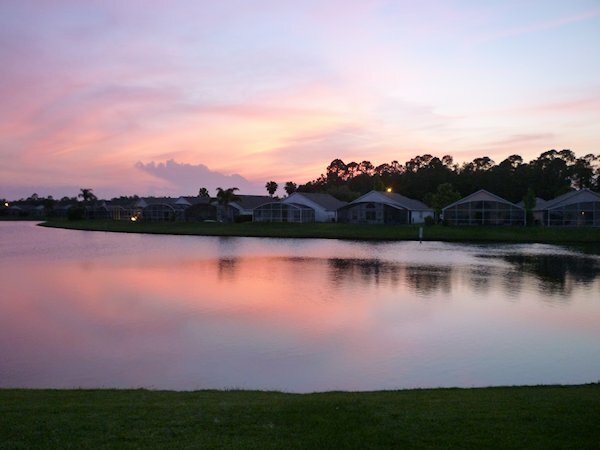 Eagle Pointe is a quiet part-residential community built around two lakes. The community offers a mixture of one and two-storey vacation homes set within a wooded conservation area. Some homes offer lakeside views. 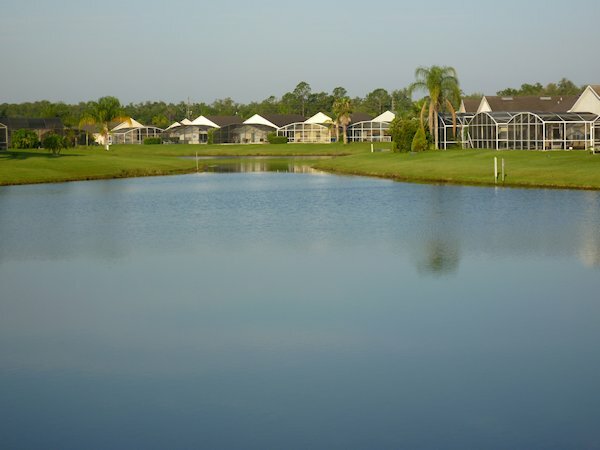 With two nearby public courses in Kissimmee - catering for all levels and offering excellent value for money, Eagle Pointe makes a great place to stay for the early-morning golfer. Travel towards US192 for the PGA rated Falcon's Fire, as well as the Celebration and Hawk's Landing golf courses which border Walt Disney World. For essentials, the ever popular WalMart located (next to Medieval Times on US192) is just under 3 miles. However, being close to US192, a couple of miles up from Walmart there is a Supertarget and around 1 mile further along US192 (at the junction with SR535) is a Publix supermarket. There are also numerous shopping outlets on the US192 and the larger Lake Buena Vista outlet towards Walt Disney World on SR535. 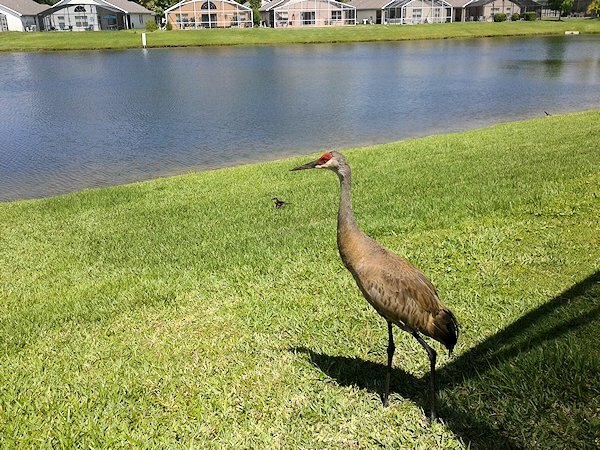 Eateries are equally abundant, with dozens of family-favourite restaurants located with a couple of miles of the Poinciana Boulevard-US192 junction. These include: Smokey Bones, Olive Garden, IHOP, Chillis, Chevys, TGI Fridays, Ruby Tuesday and Longhorn Steakhouse (to mention but a few) - choice maybe your only dilemma! For something different, what about a themed night out - watching knights at the nearby Medieval Times banquet meal? If you want to send a postcard e-mail to remind you (or a friend) of this villa, enter an e-mail address with a quick message below. You need to enter the Security Word correctly to send it. When sending a postcard, the owner of the villa will not be notified and you will not be enquiring for this villa. 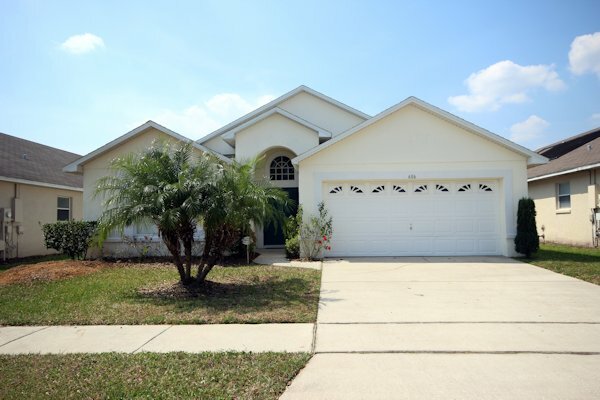 If this villa looks ideal for your visit to Florida, simply submit your preferred dates and contact details on the form below. You are under no obligation to book and once submitted, you will receive confirmation of both availability and the price from the villa owner. All bookings are made direct with the villa owners, so you get the best price and you do not pay a service fee (unlike some other villa websites). For more details on enquiring or booking a villa, view our Renting Villas FAQs. Having a problem using our website? Please tell us about it. To view the pictures full size, simply move your mouse over or click them. The recently updated accommodation comprises a large, well equipped kitchen with breakfast area which includes a fridge freezer with filtered water and ice dispenser, coffee maker, microwave oven, stove, dishwasher and toaster. The formal dining area and main living space – with plenty of comfortable seating - both overlook the pool and lake and offer stunning views. 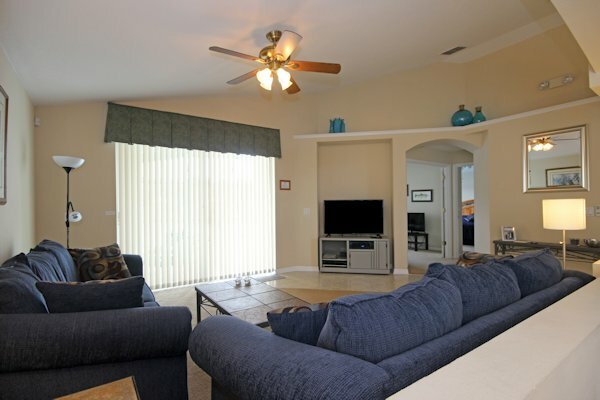 All TV’s in the house are flat screen with a comprehensive TV package and we offer our villa with free WiFi. Additionally there is a comfortable ‘den’ overlooking the lake used for reading, computer games or quiet contemplation! 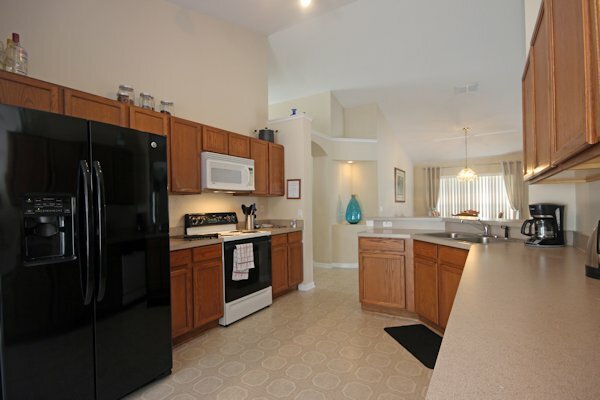 The utility room containing a washing machine and dryer is off the kitchen and leads to the double garage. 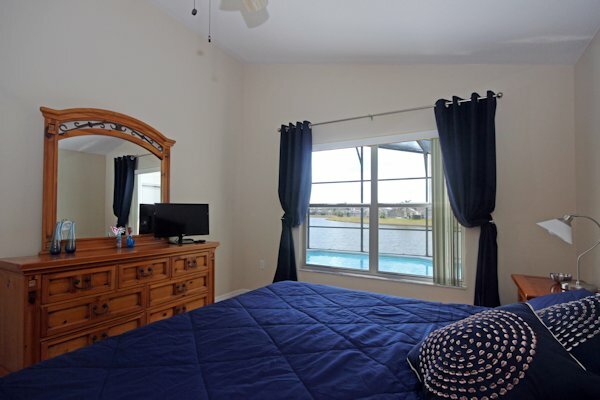 The large master bedroom has a beautiful view of the lake from the kingsize bed, a TV and spacious ensuite with bath, shower, twin basins and a walk in closet. 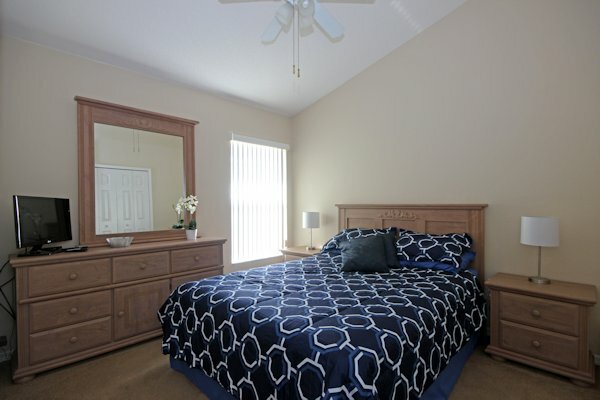 The second bedroom has a queensize bed and TV and the third bedroom has twin beds. Bedrooms 2 and 3 share a bathroom with bath and shower. 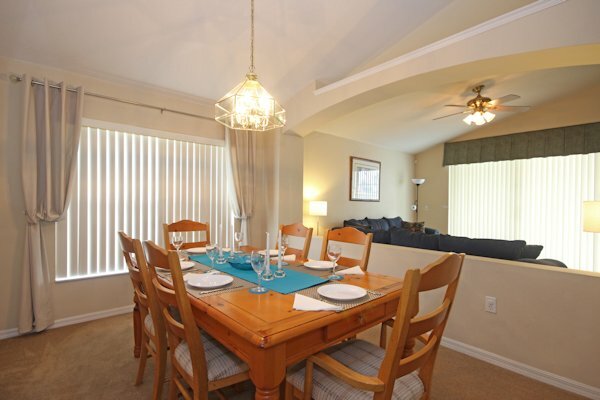 The pool area is fully screened and has a covered porch with ceiling fan. There are plenty of loungers, recliners and a table and chairs with an umbrella. We have privacy screening to the sides of the pool area and there are palms and shrubs around the outside to make this area more secluded. Don't forget, you are under no obligation to book any villa that you enquire about.